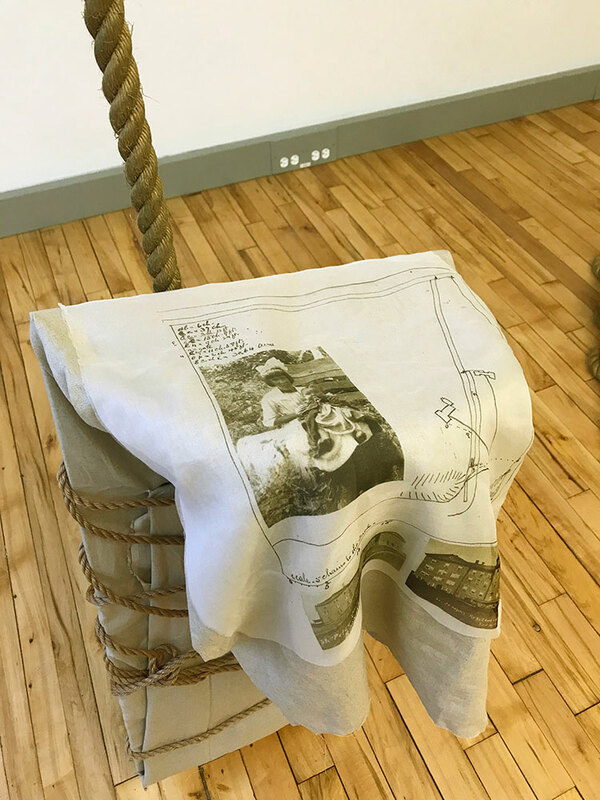 The work, How can you expect me to reconcile, when I know the truth?, was created during the Nigig Residency, January 2018, at Ontario College of Art and Design University (OCADU) Toronto (read Nigig News post here). 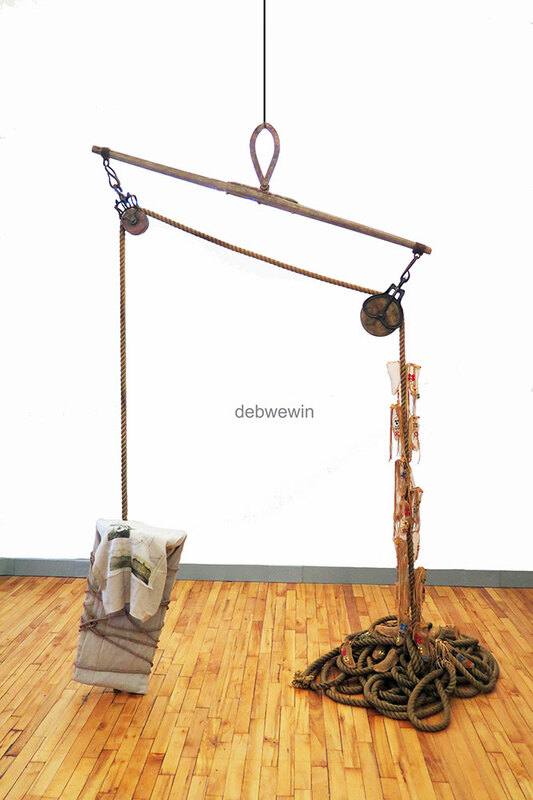 The work is a mixed media installation, 220 (w) x 180 (d) x 270 (h)cm. 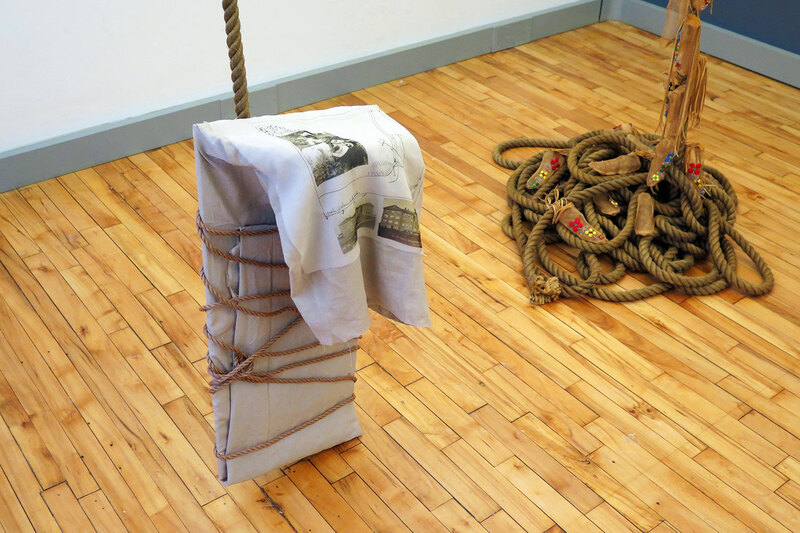 From April 12 to 15, 2018, the work was installed in the group exhibition PUBLIC DISTURBANCE: Politics and Protest in Contemporary Indigenous Art from Canada curated by Galerie SAW Gallery for Supermarket 2018 Stockholm Independent Art. The work was installed in ‘Slaughterhouse 5’ in Slakthusområdet (the Meatpacking district). More info on Supermarket Fair in Stockholm, Sweden available here. “How can you expect me to reconcile, when I know the truth?” is a response to the impact of residential school on my family. In the 1920s, children from Manitoulin Island were transported in a wooden dory boat called the Red Bug that was towed by a rope behind a motorized vessel called the Garnier. Vast numbers of Anishinaabe children were transported from the island to the mainland and segregated into two Jesuit-run boarding schools: the boys in Saint Peter Claver and the girls in Saint Joseph’s. 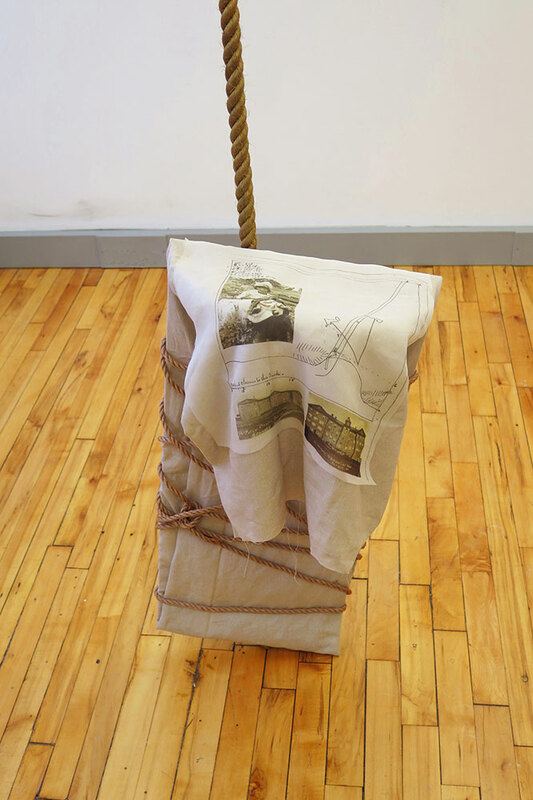 For this work, I have replicated a cradleboard and overlaid it with a bolt of linen and lashed it in place with rope. Laid on top of the cradleboard is an historical photograph taken of my great-aunt Melvina McGregor (Sagamok First Nation) holding my father Cecil Joseph Ace (M’Chigeeng First Nation) as a baby taken circa 1922. The photograph has been printed directly on transparent organza fabric to evoke a ghost-like image. Also printed on the organza is an image that I sourced from the Jesuit Archives in Montreal of the original survey drawing of the two schools along with photographic images of Saint Peter Claver and Saint Joseph’s. The hemp rope used to suspend the cradleboard is similar to the rope that was used to pull an open boat behind the motorized Garnier. This open boat was called the Red Bug and was used to transport children from Manitoulin Island en route to Spanish, Ontario. 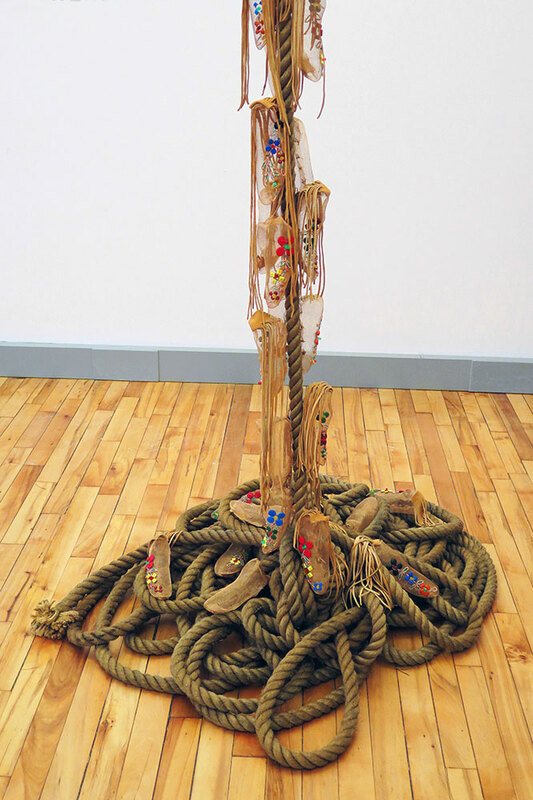 The thick hemp rope extends from the cradleboard through two wooden pulleys attached to a wooden yoke that together reference the nautical and the burden of assimilation. Cascading down the rope that pools and coils on the floor are small bronze wire shoe forms that are molded from a child’s wooden shoe last. 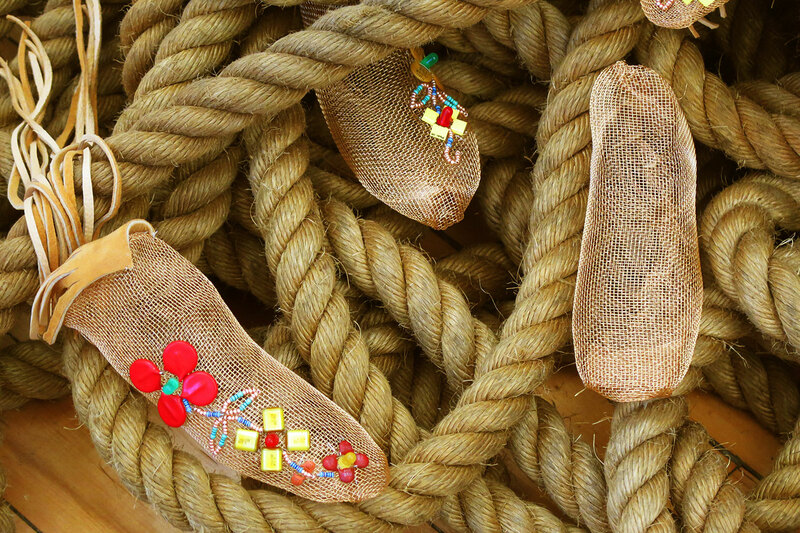 Some of these wire moccasin-like shoe forms are adorned with deer-hide fringe and electronic components with glass beads to form Anishinaabe floral motifs. 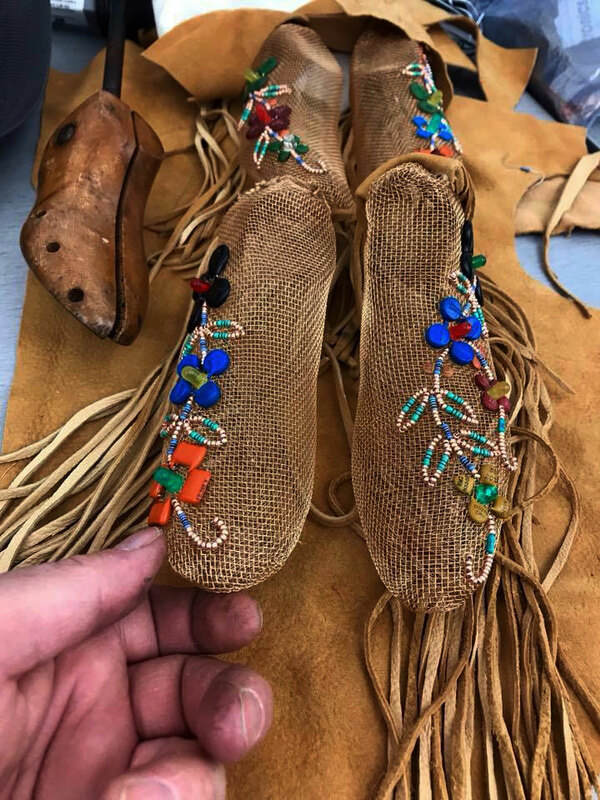 The shoes are held transparent and hollow to represent the impact of assimilation and cultural loss, while the shoes that have partial floral motifs represent some aspects of the culture and language that survived to be passed on to future generations. 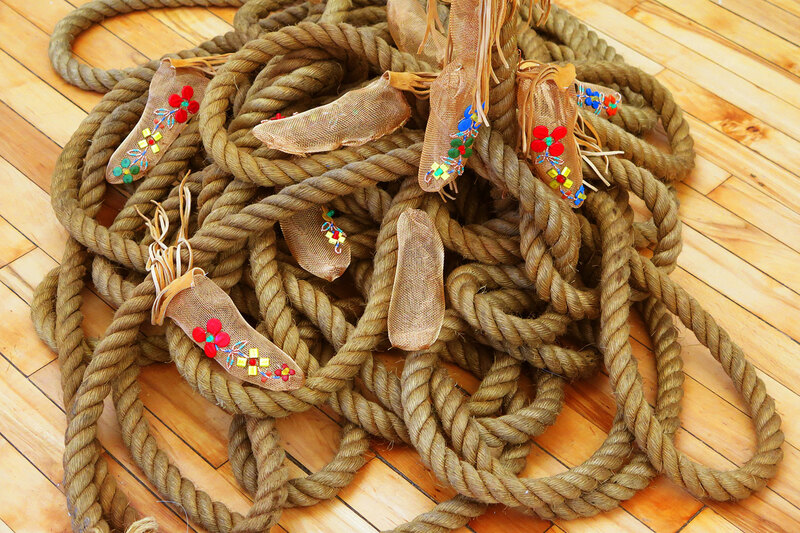 The hide fringe reference trail dusters that were once affixed to the heel of moccasins that dragged behind the wearer to erase evidence of their tracks. But these dusters are falling forward representing the experiences and stories of these children that must never be forgotten or erased. The vinyl text mounted on the wall spells out Debwewin meaning Truth in Anishinaabemowin.